Favorite Line: "You have to think on what we do today and whether we do it right. That's all we can do." Starred Review. Vida's luminous, dramatic seventh novel finds Joseph Kimmel, a Missouri school teacher, heading to mid-19th-century Texas to claim his recently deceased brother's belongings; he's left for dead when his horse is stolen. Across the plains, after her Texas Ranger husband dies fighting Comanches, Aurelia Ruiz takes refuge at a Comanche camp and adopts their ways. Henry Castro, a Frenchman with dreams of creating an Alsatian-immigrant–populated town in his own name, not only rescues Kimmel but marries him off to Katrin, an unattached white émigré whom a Comanche leader had espied and wanted for his own. The newlyweds head off to create a distinctive ranch, one that welcomes members of the Tonkaway tribe, Mexicans, escaped slaves, free African-Americans and others in distress. Affairs of the heart are never neglected in Vida's novels (Goodbye, Saigon, etc. ), and Kimmel soon finds himself enraptured when he meets the beautiful Aurelia, just as a posse of xenophobic ranchers wreak havoc on the ranch. This radiant work of historical fiction—vibrantly atmospheric and emotionally dense—spans 12 years in the lives of many engaging characters, who come to life on every page. I have never been a fan of Texas. It is a state that is really pretty full of itself and seems to think it's the greatest thing since sliced bed. It is also far too fond of the death penalty, in my opinion. But it certainly captures the imagination, especially when it comes to historical fiction. 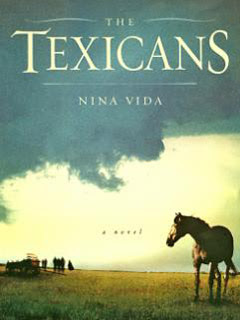 And it seems as though the author, Nina Vida, is smitten by the Lone Star State. Vida, like most characters in her book, also knows how to go after what she wants. I don't know how many bloggers she contacted to read and review and give away her book, but it seems like in the past several weeks, The Texicans has shown up all over book blogs. Good for her :-) I'm glad it's getting attention as I think it's a deserving book. The Texicans is not a happy book. None of the characters are content and I didn't sympathize with any of them. I felt sorry for them all but I didn't like any. It didn't particularly seem as though any of them liked each other, either. They would have conversations and just not listen to each other- one would be talking on one subject, and the other would be talking about something completely different. It was sad. What a lonely way to live. I suppose, living on the Texas frontier, one would have to get used to loneliness. And how many of us have conversations with people and don't really pay attention to what the other person is saying? Probably more of us than would like to admit it. I guess I would say that the main character of the book is Joseph Kimmel, but the character who drives the book is Aurelia. She is, however, not in the book nearly as much as the other characters, except at the beginning. As I have often mentioned before, and will undoubtedly do again, I do not like books in which there is a femme fatale type of woman with whom every man falls promptly in love (or in lust or whatever) for no understandable reason. Aurelia is one of these women. It must be tiring being her, always upsetting people's lives. She is a mystery to me- I never fully understood what made her the person she was, or what she was thinking or how she felt about anyone. I never got any sense of her feelings for other people. I don't even know if she had feelings. But she definitely sets the tone of the book. This novel reminded me a lot of Kate Grenville's The Secret River, one of my favorite books. Both are about settlers in a harsh area of the world, and the way that life on the frontier can shape a person. Both books are much more about character development than about plot. Vida meticulously shows us how a man can become wonderfully successful but still be unhappy. She paints a picture for us of a woman who survives a horrible experience and is never the same afterwards. And, most painfully, she shows how people who are so close to each other, living in the same house, can be almost complete strangers. Personally, I didn't like the ending of the book. I found the conclusion between Joseph and Katrin somewhat of an anticlimax. I also wasn't a fan of the way Vida ended Aurelia's story. I think we would have been better off as readers without the epilogue-type of chapter at the end of the book. Oh no, I really must like someone in a book to be able to go on. OMG! I can't believe you hated on Texas like that at the beginning. :p But since Texans are magnanimous and friendly, I'll forgive you! I, too, have seen this book everywhere. I had hoped that it would be a good one because I usually like stuff that deals with the frontier, but I definitely wouldn't like the femme fatale character who everyone falls in love with. In my opinion, that type of characterization is a bit lazy. It's too easy to have a character who everyone is in love with, and I find it a bit boring. I also need at least one sympathetic character in my reads. So, I don't think I would like this book. I really liked your review of this one. Lots of stuff to think about here. I'm not fond of the beautiful woman everyone loves either but I do love Texas a wee bit. Like everything else, the stereotype doesn't tell the whole story. A Sec ret River is one of my all time favories! However, when Nina Vida sent me an email asking if I would like to review her book, I said "no thanks." I didn't think it would be my cuppa but maybe I was wrong. Oh well, I have way too many ARC's at the moment anyway. I'm glad that I pointed her in the direction of "Book Blogs", it looks like she got a lot of reviewers from that.